Sundays — Sun: 9:30 a.m., 6:30 p.m.
Daily — Mon, Thu: 9 a.m.
St. Brigid Parish was established in 1907 as a mission of St. Patrick in Stithton, because a church was needed in the small rural town of Vine Grove. A building was purchased in 1908 from the Northern Methodist congregation. It served the little Catholic parish two Sundays of each month. The parish grew rapidly when the federal government acquired the community of Stithton and displaced both the parishioners of St. Patrick Church and its pastor, Father Rudolph C. Ruff. In 1918, St. Brigid was raised from a mission to a parish, and Father Ruff became the first resident pastor. Under the pastorate of Father Guido L. Mensa, the parish continued to grow. In 1929, Father Mensa built the present St. Brigid Church. 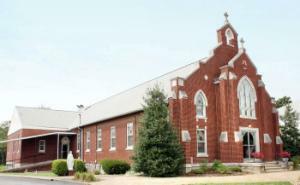 St. Brigid operated a school from 1938 to 2004. For many of those years, teaching support came from the Ursuline Sisters of Mount St. Joseph. St. Brigid Parish is a close-knit community that reaches out to all in need. The parish always exceeds its goal for the annual appeal for the Archdiocese, donates Christmas baskets for the needy and for elderly neighbors and shut-ins on the Christmas Giving Tree, makes contributions of money and items needed for the Crossway Pregnancy Center, and gives generously to natural disaster relief and numerous other civic needs in the area. The church has been expanded and modernized twice to continue to inspire its more than 900 parishioners in their worship at Mass. Parishioners participate regularly in Bible study groups, in novenas and other devotions, and in the Growing in Faith Together (GIFT) program. In addition to events for the soul, church activities include the parish raffle, spaghetti supper, cake auction, and other community-building events. The parish raffle replaced the annual church picnic which had been held from 1929 through 2004. St. Brigid is a good place to grow in every way.